In this episode Shahriar repairs an Anritsu 37347A 20GHz Two-Port Network Analyzer. The unit does not boot up and as a result its internal state is unknown. The boot fault is traced to a bad RTC module which has a built-in integrated battery. A replacement unit is located which allows the unit to fully boot. 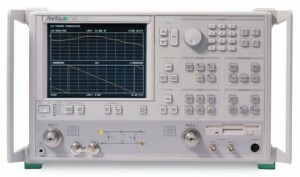 The instrument initially displays an unlock condition on the internal PLL. This problem is resolved by loading the PLL calibration files from the HDD. The complete block diagram of the unit is examined in detail and an unusual PLL intermittent locking problems is demonstrated. Various measurements on several of the internal PLLs confirm their functionality. As a final experiments, the instrument is calibrated and the S-parameters of a tune-able band-pass filter is measured. Very nice video, it real helps a lot. But My 37369A always display “6024 phs lck fail DE” after I replaced the Timekeeper, and BT1. As you mentioned, you fixed the YIG osc lookup table, could you please explain it more detailed? Great video, as always. The most informative part for me as a beginner in the HF field was actually the block diagram you went through. Your process of debugging is also very interesting, and the more of your thoughts you are able to communicate as you go through the repair steps, the more I enjoy your repair videos. Haven’t seen any new posts in a while, Shahriar. I hope all is well with you, and that you’re enjoying some personal time (as opposed to crazy busy at work). But please know that your videos are very much appreciated, anticipated, and enjoyed by so many of us. But you are missed! Nice video but I’d like to see how you use the VNA – not only how you repair it. For example how to measure the characteristic impedance of an unknown coax with it, how to calibrate it using the SOLT method and other methods + what are the differences between them. What are the common traps of using a VNA. You did similar videos about scalar spectrum analyzers, but I don’t recall you taking about the difference between them and VNAs from the operator’s point of view. awesome video! thanks for putting this again! Another great video – many thanks once again. Particularly amusing for us old guys to watch someone discover the mysteries of a MVME based piece of hardware and its software “features” – namely the need to set the clock before anything will work – a useful reminder to those who were cynical about the significance of the Y2000 bug!! i always enjoy the videos you put together. thank you so much. it is generous of you to share your knowledge. I could find room for this on my bench for sure! How do you get so lucky so often? I always enjoy your videos. It’s a lot of fun to learn how to solve problems and I think you’re doing a great job at communicating how. Even though its just outside of my comfort zone i did watch the video fully, including the block diagram part. I’m also interested in a repair of the PLL board. Thanks for the great videos, all of them. Thanks for another great video! I would like to see a repair of the PLL board, if you can find the time. Can you recommend any good literature where I can read about this stuff like S-parameters? Thanks — great video. Enough depth for me.